Arsenic is a naturally occurring element that can enter drinking water supplies from natural deposits in the earth or from agricultural and industrial practices. While arsenic is not in common use today, it was once an ingredient in some pesticides, and residues remain from past use and improper disposal. The health risks associated with arsenic result from low-level exposure over a long period of time. Some people who drink water containing high levels of arsenic for many years could experience skin damage, problems with their nervous or circulatory systems, and may have an increased risk of developing some forms of cancer. The maximum contaminant level (MCL) for public water systems is 10.0 micrograms per liter (aka. parts per billion or ppb), however any level of arsenic may be harmful. 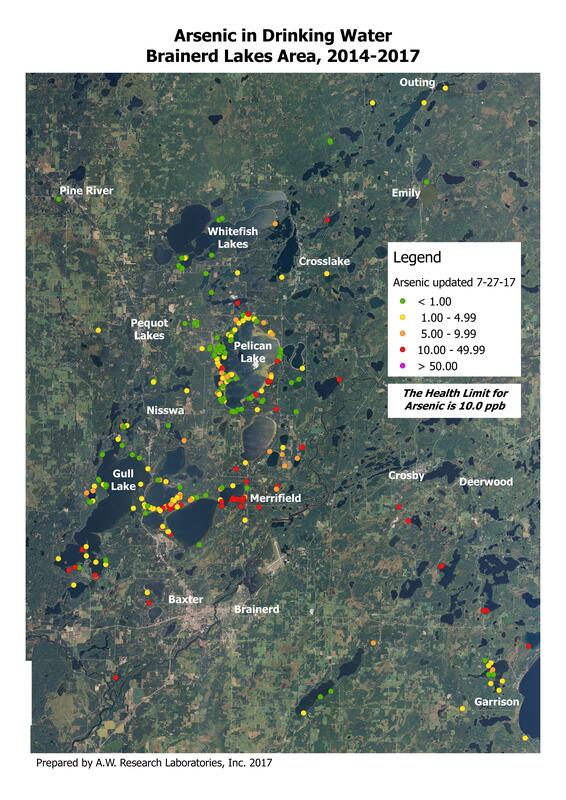 The Minnesota Department of Health estimates that approximately 10 percent of wells in Minnesota have natural arsenic levels greater than the MCL. Arsenic in water has no taste or odor, and can occur just about anywhere in Minnesota, so the only way to know if your well water contains arsenic is to have it tested. While well owners are not required to test existing private wells for arsenic, all newly drilled wells must be tested for arsenic. The Minnesota Department of Health recommends that every well be tested for arsenic at least once. Most of the arsenic in Minnesota was deposited by glaciers and is present in all soil and rock. However under certain conditions, more arsenic can dissolve into groundwater resulting in contamination. In some areas, wells that are completed just below a clay layer at least 10 feet thick can have higher levels of arsenic than other wells. Another major source of arsenic in groundwater is historic pesticide use associated with agriculture. If your well has never been tested for arsenic. If you are purchasing or renting a new home and the arsenic level is unknown. All private wells should be tested at least once. If arsenic is found, the well should be tested every 3-5 years to monitor changes in the concentration. What if my water has high arsenic? It's up to the homeowner to determine at what point they will treat their water for arsenic. Treatment systems that are able to remove arsenic include ion exchange and reverse osmosis systems. Contact a water treatment professional for more information. Once a treatment system has been installed it is important to monitor your water on a regular basis to ensure the system is removing the desired amount of arsenic.